Nicole parked her car in her parent’s drive and killed the engine. Mid-morning sunshine filtered through the trees promising a bright, spring day. There were no other cars and the house was dark, all according to plan. Barring any surprises, she’d have the whole day to herself. She breathed a sigh of relief. Not that visiting her parents was awful or anything, she just didn’t want to have to explain why she was there. Most of all, she wanted to avoid the barrage of concerned questions, the offer of money they didn’t have, the I-knew-that-art-degree-was-a-mistake lecture, and worst of all the suggestion that she could move back home if she needed to. If her fine art career were really over, she’d wait tables before she’d let that happen. She refused to be the cliché thirty-something that ran home whenever life became too real. She retrieved her phone and thumbed to the eBook she’d been obsessing over. It guaranteed revitalized creativity if she followed a few simple steps. That’s all she needed, a glint, a flicker of inspiration that she could flame into a new collection to bring to the galleries and get things moving again. Unfortunately, Nicole’s introverted sensibilities balked at all the ideas so far. Wearing disguises in public and singing Karaoke (no matter how many glasses of Pinot she drank) were too far out of her comfort zone. She didn’t think her creativity could be frightened out of its hibernation. One should coax the sleeping bear out of its den with the promise of honey, not startle it awake with firecrackers. But, Nicole could and would revisit the places she played as a child. She’d had a powerful imagination growing up, and rekindling that potent force would go a long way to get the paint flowing again. She packed her notebook, pencils and a bottle of water into her tote bag and stepped out of her car. She locked the car out of habit, tossed her keys into the tote and slung it over her shoulder. Inspiration, here I come. Thirty minutes or so later, she began to feel the cloying fingers of disappointment brush against her heart. Decades can do a lot to erase the footprints of childhood memories. The tire swing had long ago been taken down from the oak tree in the back yard. Nicole was partly glad, she would’ve been afraid the old rope too rotten to support her weight. The tree-house, or rather the haphazard platform, she’d built within the branches of a grove of crab-apple trees was also gone. She stood there a few moments trying to recapture a glimmer of her childhood adventures. The sunlight filtering through the leaves cast dancing shadows at her feet. She remembered scraped knees and fingers stained magenta from poke-berries, the bitter taste of crab-apples and the velvet of iris petals. But, the images that swam through her mind were shadows of inspiration, cold and empty. There was one last place, one last chance to find the spark. She took a swig of water and headed toward the path through the woods she had explored so often in her childhood. Even though her boots had a sturdy heel, Nicole picked her way carefully to avoid the marshy spots in the soil. She had her phone in hand, ready to snap pictures as soon as something worth photographing revealed itself. Finally, standing by the water’s edge, she surveyed the pond where she’d played as a child. Her shoulders slumped and she slipped her phone back into her bag. It seems so small now. She hugged her arms around herself. Memories of chasing tadpoles in mud-caked pants floated through her mind. She took in her surroundings. This place where her imagination had played so freely was almost unrecognizable to her now. What once had been steep slopes to small feet and short legs, were now eroded to gentle rises. Where the woods had been thick and the pond secluded, a nearby housing development could be seen through the trees. The pond itself with all the childhood magic stripped away was nothing more than a square watering hole about the size of a two-car garage. Bird-song drifted from nearby branches and the sun warmed her face and shoulders. Nicole half sat and half leaned on a large boulder set close to the pond’s edge, and remembered again how enchanting this had been when she was eight. It had been a sheer cliff face by the sea when her dolls joined her on her adventures. To her younger self, they turned to mermaids when she submerged their bodies, their hair flowing in soft clouds with each gentle caress of the water. She shifted on the boulder and leaned over the water to gaze at her reflection, half expecting to see a mop of tawny, disheveled waves atop a dirt-streaked face. Instead, she saw her adult self, looking older and more haggard than she wished. Or maybe, coming here to remember her childhood only brought feelings of mourning for the lost joys of her youth. Simple pleasures delivered satisfaction easily, before beliefs in fairies and unicorns were replaced with knowing that the world is difficult and complicated – that magic isn’t real. Her chest tightened and she gulped down a sob. Nicole wished she could be that little girl again. She wanted the magic back, to lose herself in a world of her creation. Her likeness gazed back at her, darkened eyes and down-turned mouth. This was a waste of time. She toed small stones into the water and watched the concentric circles spread outward. Her reflection distorted, revealing the shadow of another face behind hers — like a double-exposed photograph, strange yet compelling. Nicole reached a hand toward the water and the phantom reflection did the same. At the moment her fingers touched the surface, she found herself beneath the water. Sunlight danced on the wavy surface, adding sparks of light to the warped images of treetops, sky and clouds above her. The bottom of the pond below her was hidden in darkness, seeming impossibly deep. A dragonfly trapped in amber, she hung suspended, holding her breath. When her lungs began to burn, Nicole clawed at the water, frantic to reach the surface. And then, he was in front of her, pulling her to him, holding her still. When her struggling subsided, she realized she could breathe. Underwater. Logic faded as she marveled at the beautiful creature before her: eyes a sunlit summer sky, skin a polished bronze, and hair that floated about his face in wavy, black locks that glinted in iridescent shades of violet and green. A stranger, but also oddly familiar. Ribbons of sunlight danced across the striking planes of his face and broad chest. Nicole’s gaze followed the twisting lights down his torso and wondered at his smooth bronze flesh, blending seamlessly into a muscular tail that gleamed in shades of cobalt blue. His tail wasn’t the scaly skin of a fish, but more akin to the sleek flesh of a dolphin. She wanted to touch him, but held back. She felt clumsy and awkward beside his graceful, streamlined form. Her jeans and shirt clung to her body, wrinkled and bunched from the water pressing in around her. Nicole felt a pull on her hands and looked up into his face. His kind eyes and warm smile reassured her. 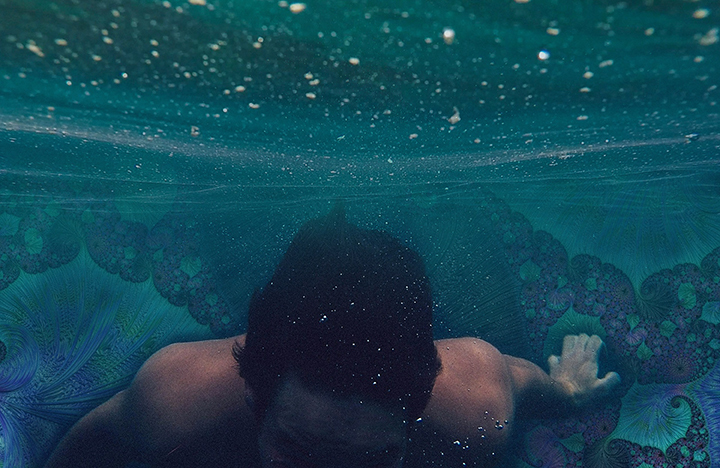 She opened her mouth to ask his name but underwater she couldn’t make a sound. She tried to return the warmth of his smile and wondered if he could tell she was blushing. His expression changed, questioning. Do you trust me? He seemed to ask. She nodded and squeezed his hand in response. He pulled her close, angling her body against his side. Keeping one of her hands in his, he wrapped his free arm around her middle. She rested her arm along his and clasped the strong hand-held out slightly in front of them. And then they were swimming. Or at least he was swimming and she a parcel carried beside him. Leading her this way, she thought they might look like a pair of ballroom dancers gliding across a polished floor. The sunlight faded away as they dove into the darkness. Nicole noticed a warm light ahead, as if a fire burned in a faraway hearth, glowing warmer and brighter as they approached. Nearing, she could see that the light emanated from the opening of a cave. They entered, plunging Nicole into a new world of light, filled with colors so vibrant her eyes widened in awe. A vast expanse of rolling hills stretched out before her, covered with moss-like grasses that flowed like languid ocean waves in hues ranging from yellow-green to teal. Thick clusters of slender trees reminiscent of van Gogh’s cypresses fringed the meadow, undulating like belly dancers -– at some moments appearing blue and green and at others violet. Contrasting against the vegetation, the cavern walls were swirls of robust garnet at the base, through orange, to gold in the heights before blending into the warm glow of light streaming in from some inexplicable source. So much color… What is this place? Nicole thought, her gaze slowly wandering back to her host. Looking into her eyes, he placed their still joined hands over his heart. Home, he replied. Her surprise at this unspoken communication lasted only a moment. She surrendered to the magic of this man and allowed the beauty of this place to envelop her. Nicole suddenly recognized her surroundings as if she’d never left. She remembered swimming through the fields, the mossy fronds tickling her face and arms, playing hide-and-seek among the dancing trees — with him. He had been much younger then, of course, matching her age every time she visited. And, she had come to this place often. Nicole flung her arms around her long-lost friend. He returned the hug and as they pulled away he reached behind her head and pulled away the clip that secured her hair. Curling tendrils floated around her face and shoulders, shimmering in shades of gold. Nicole spun away from him, feeling light and graceful as she twirled suspended, weightless. She swam to the meadow, touching the silky fronds and wondering at their iridescence. He swam up beside her, and taking her hand they swan over the meadow. Together they barrel-rolled and flipped and circled the wavy trees. Breathless, they floated over the meadow grasses once again. Nicole looked around at this magical cave, her mind hungry to memorize all the colors and the shapes of every leaf and swirl. She turned her attention to the man resting beside her, gazing into his sky-blue eyes. He brushed her cheek with the backs of his fingers. Instinctively, she tipped her face toward his caress. He cupped the back of her head as he captured her mouth with his. Heat from his body washed over her, curling her toes. Nicole wanted to lose herself in his warmth. She didn’t want this adventure to end. She didn’t want to leave this man, this beautiful creature she had long ago decided couldn’t exist. He was here, she could feel him. He was real. Her feelings were real. Magic was real again. He gathered her close to him, kissing her, caressing her. It filled her with longing to the point she thought she might catch fire. He held her tighter, the kiss deepened. She tangled her fingers into the locks of his hair. They twisted, spiraling weightless. Their embrace continued a slow spiral, and she could feel they were rising. Nicole sensed through her eyelids the space around her brightening. They rose faster, the light above them becoming stronger, harsher. She squeezed her eyes tight against the intensity. Their ascent slowed and their kisses became gentler, their embrace softened and relaxed into a loose hug. Lastly, their mouths separated and Nicole opened her eyes, squinting against the light. She looked at her beautiful merman, sorrow casting a grey cloud across his sky-blue eyes, a bittersweet smile curving his lips. She felt the pull of her world like gravity and she gave him one last kiss as she floated up as he drifted down. Her fingertips brushed along the contours of his arms as they slid from around her. His lips brushed the back of her hand just before she slipped entirely from his grasp. Fighting to reach him, she clawed at the water and churned with her feet. She made no progress and could only watch as he faded into the darkness below. When he vanished completely, she surrendered and the light consumed her. Nicole blinked away the glare from the sunlight dancing on the water. The world had returned to dreary normalcy. Even though the sun shone warm on her shoulders, the world felt cold and harsh. The hard boulder beneath her made her bottom ache. A gentle breeze played through her loose hair and a wavy tendril caught her eye. She reached up and let the curl play through her fingers. Nicole looked out over the glistening pond. She brushed fingertips across her lips and could still feel the lingering heat of his kiss. When she closed her eyes, the memories of the cave burst in her mind like technicolor fireworks. She scrambled to rummage through her tote for her pad and pencils while the memories were still fresh. Behind her, a man cleared his throat. Startled, Nicole stood and turned, almost losing her balance. “Yes?” Nicole searched his face and the smirk became a crooked smile that glinted mischievous sparks in his eyes. Then, she knew him. “Ricky Ryan.” The name came out with an accusatory tone she hadn’t intended. She crossed her arms and huffed, slightly embarrassed. Yes. Nicole looked him over. He was a far cry from the scrawny boy who’d played with her around this pond. She’d enjoyed his company until he’d found more pleasure in pulling her hair, chasing after her with twigs he claimed were poison ivy and tossing her dolls into the center of the pond. Now, Rick, tall and strong, stood before her in dark jeans that were tight enough to show he had muscled legs and lean hips, but loose enough to keep other details a mystery. His work boots were worn but not ragged and he wore an untucked plaid shirt over a clean white t-shirt. Nicole hesitated. She looked around at her small pond, her hands twitched at the thought of sketching out her ideas. She turned back to meet his gaze, determined to turn him down. But, when she looked into his eyes her breath caught. They were the bright, clear blue of a sunlit summer sky. “Coffee at Hale’s?” he asked, stuffing his hands into his jeans pockets. “I’ll throw in peach cobbler,” he offered, taking a cautious step forward. She stood and met his gaze without flinching. “You used to call me ‘Nikki, Nikki. Stinky, sticky.’ and then, tried to dunk me in this very pond.” She pouted her lower lip. “With ice cream,” Rick said, his lips curving up. He took another step closer. “Do you have a lay-a-way plan?” He asked, closing the last of the distance between them. He held out his hand to her and she took it. Electricity tingled up her spine. ***This is a short story based on a poem I created in high school that is forever lost. I rewrote the idea as a short story and submitted it to my writers group in February 2013. I revised it and resubmitted to my group again February 2017. What I’ve submitted for this post is culminated from all the feedback I’ve received. If you have any thoughts or comments, I’d love to hear them. May you reconnect with the imagination of your youth and enjoy the journey to your heart’s desire! Love, love,.love this story, Denise! You paint a vivid picture. Rick sounds kinda yummy. Nicole should definitely go for coffee. Laura, thanks so much for taking the time to read my little story. I appreciate your feedback!